Following in the footsteps of some very highly acclaimed busts of contrasting eras and locations this bust goes to the Pacific Islands of Guadalcanal for it’s inspiration – 1942 and the marines are fighting hard against the “japs” for every scrap of island they can get – this bedraggled Marine looks up into the distance and squints at the tropical sunshine.. 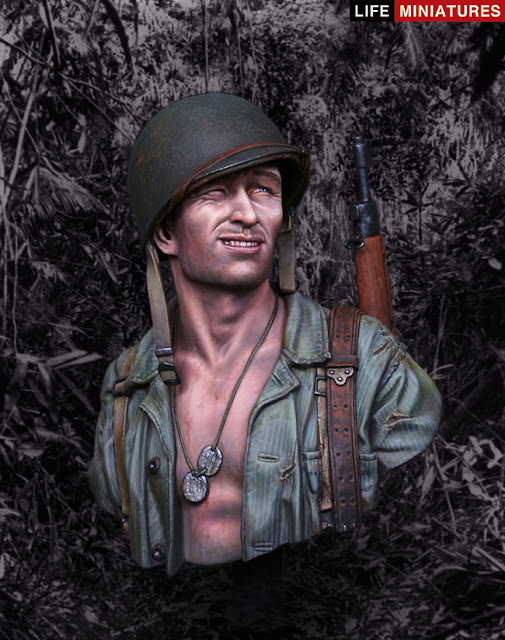 The attractive box art is painted by Mr. Lee himself and it gets you keen to have a crack yourself at panting the made up kit – first we will look at the parts inside.. 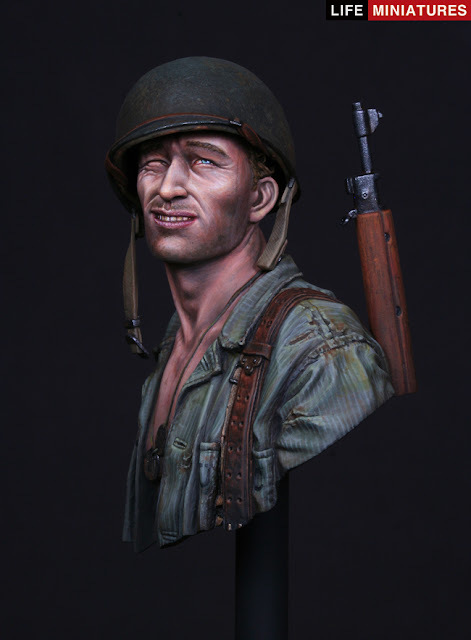 In the well-padded box we get eight parts of surprisingly nice smelling resin ( I have been modelling far too long I realized just now) – each part is connected to a casting part s- none of which were hard to remove, the actual making of the kit parts won’t take half as long as your artistry to paint it! 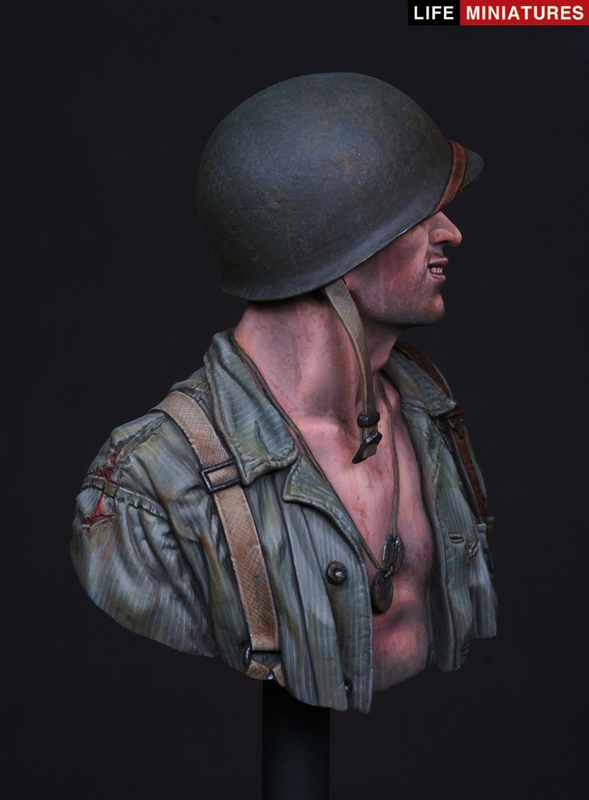 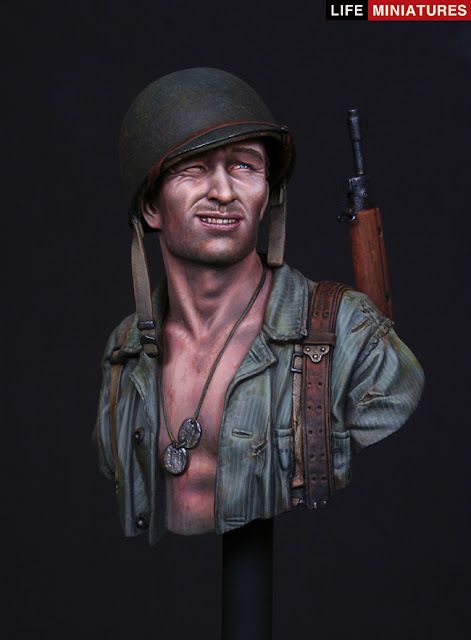 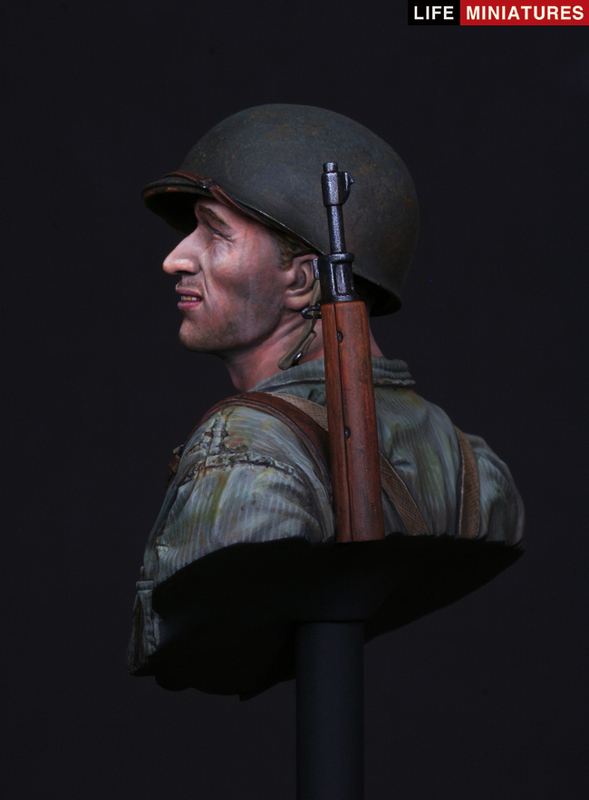 The model artwork reminds me of a famous photograph of a marine on the island at that time – though this soldier looks a lot better for wear than the kit - the figure of this bust is unshaven, unbuttoned and unwashed. The artist’s inspiration is important to me – and so I contacted Sang Eon about the kit – and about his inspiration of sculpting the piece. 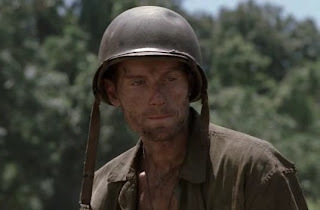 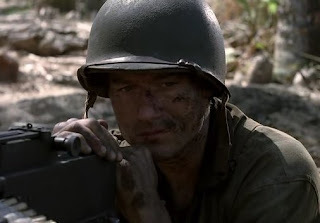 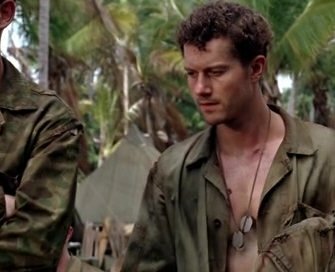 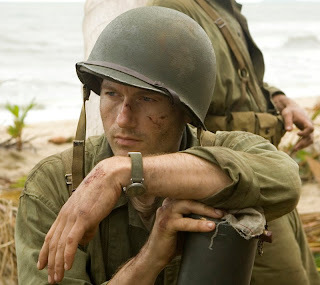 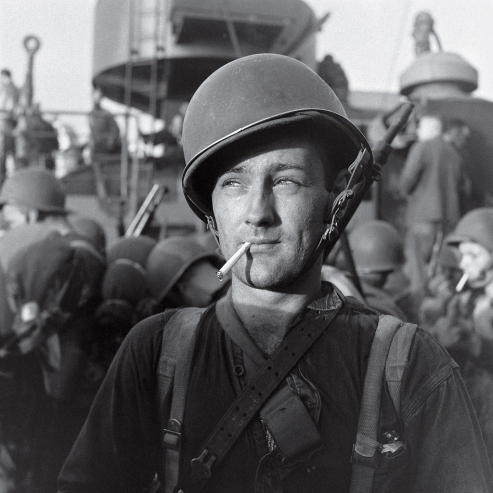 He was able to confirm that – yes this was one picture he used when sculpting the piece – as well as the mini-series “The Pacific” in which the famous soldier and later author of his experiences Robert Leckie. “Lucky” Leckie was portrayed with such aplomb by actor James Badge Dale in the series – and it was the face of this actor that was Sang Eon’s other inspiration whilst sculpting this bust. 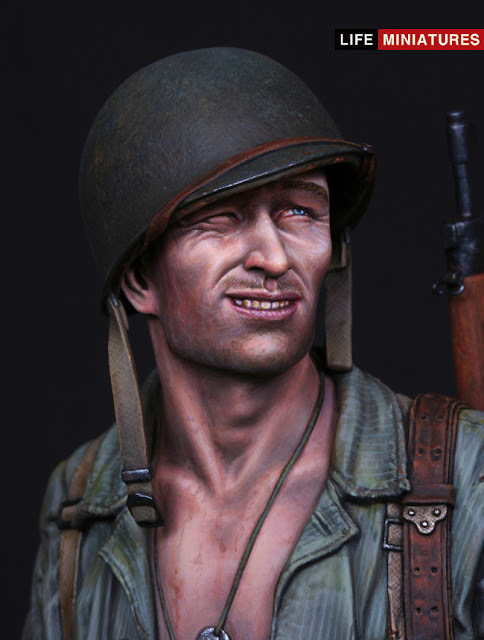 The screen grabs above are just some of the images used. 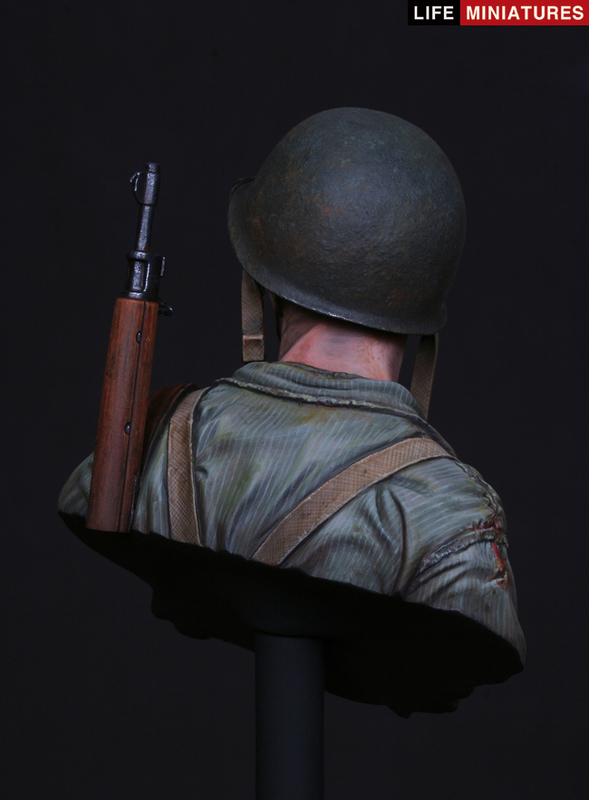 The resin in the kit is a light grey which is easy to carve and was bubble free – there aren’t any imperfection in the moulding I can see – even when getting rid of the casting blocks there weren’t any imperfections or nasty surprises – and the blocks came off easily without any “collateral damage” as well. 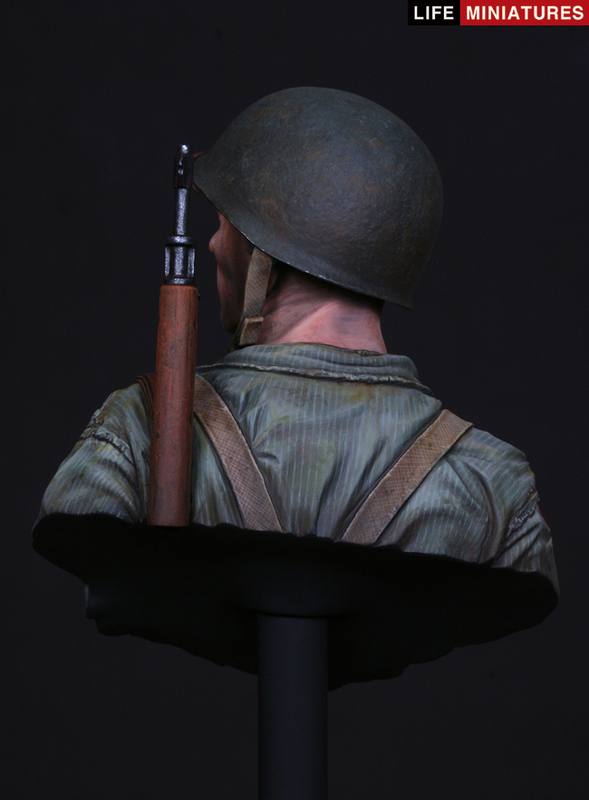 Sculpted by Sang-Eon Lee, this figure shows some really nice elements of a master at his work, in the sculpting the fine lines in the Marines clothing to the texture on the M1 Helmet and the Springfield rifle he carries, not to mention the natural look as he squints off into the distance – this figure looks like it will be a model maker’s favourite just like his other pieces. 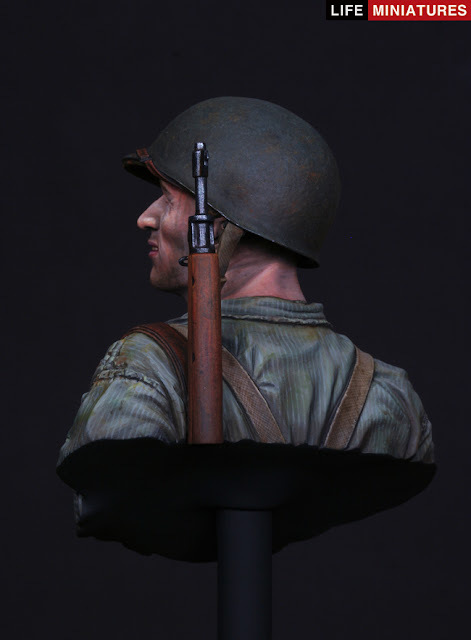 The engineering of the kit should be applauded - there is a very interesting neck join on the soldier’s bare neckline – in a long “V” shape it traces the raised line of the dog-tag chain down his front and around the back of the bust – the head part sits in there very well. This makes the figure look up at precisely the right angle the sculptor wanted and this along with a helmet that sits squarely on the head and the rifle barrel which sits snugly in the recess made for it makes you confident you are getting it right when putting this together. 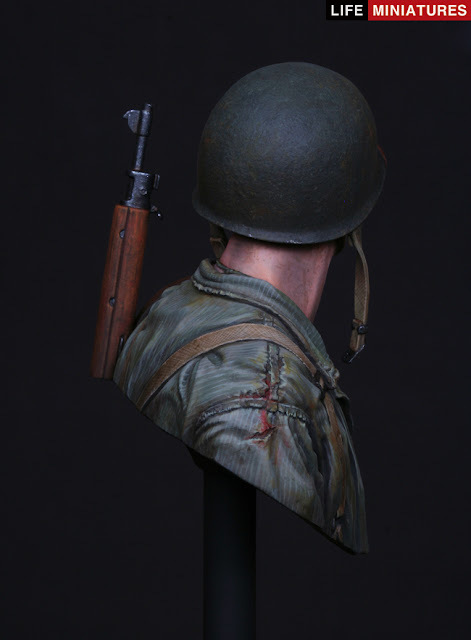 There are nice little extras – the rifle catch is so fine but sits off the stock very nicely, the chin straps for helmet sit very naturally and the slightly bumpy texture of the surface detail on the helmet just cries out for a dry brush. The button holes in the clothes and the holes in the leather along with the texture of the Marine’s clothing are all realistic little parts that make what is an excellent impression on me when I made this kit. 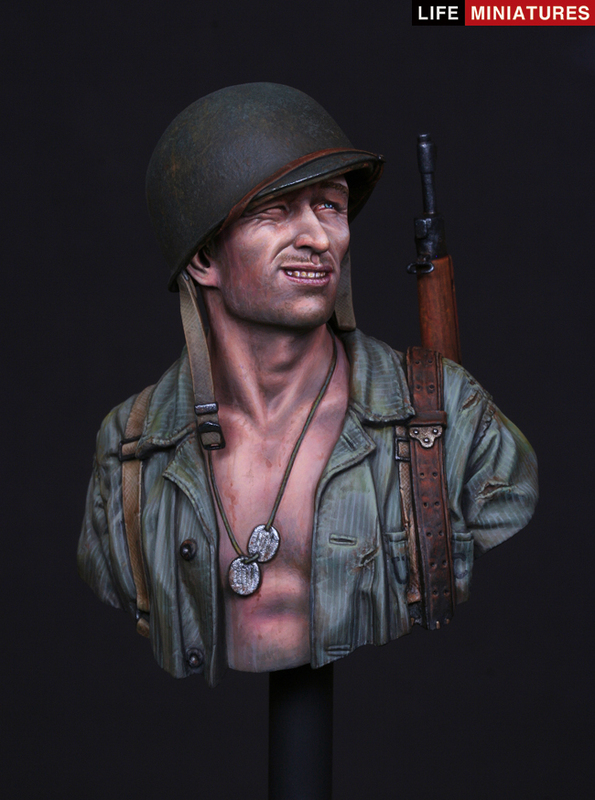 I shan’t be painting it – at least not until my skills improve - but after this review there are the shots from the sculptor himself who did a masterful job of painting his own creation – although I have a long way to go on the painting I feel that if you wanted a great bust of a marine – or indeed a great bust to model – well this figure is definitely one I would consider first.